Today WordPress celebrates it’s 10th anniversary with parties and meetups all over the world. 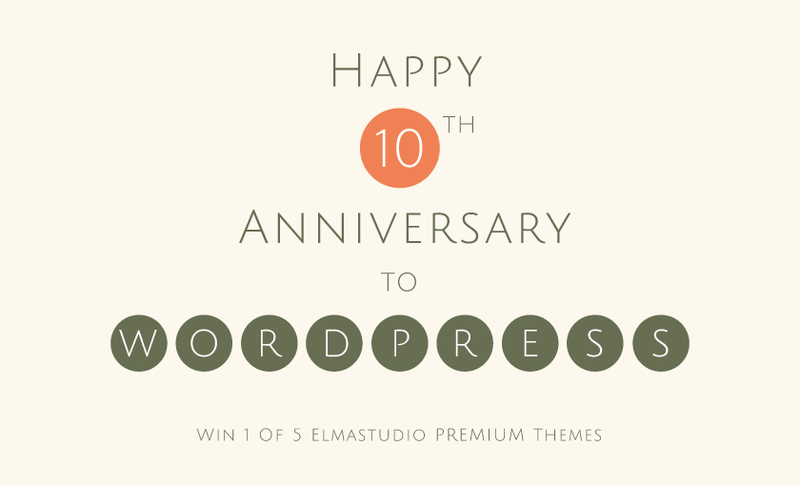 We also want to celebrate this wonderful occasion here on our blog by giving away 5 Premium Elmastudio Themes to our readers. To win one of the themes you you have to do is write a comment here on the post letting us know why you like WordPress and what you think is so great about it. All winners will be contacted by email and can then choose their theme of choice. The giveaway will end on Wednesday, May 29th, 6pm (CET). It’s important that you include a current email address with your comment, so we can reach you easily. We’re looking forward to your comment and we wish WordPress all the Best and of course lots of success for the upcoming years! I like WordPress because it is an easy to use and very flexible system for both blogging and content management. It is easy to use for many things. Light and fit. Great themes. Hope I win. WordPress has become my job… What is my job? Matchmaking supposedly compatible open source shareware into awesome websites for happy clients :) Thank you WordPress. Many great features, plugins, themes and a great community. It’s easyer than other CMS or Blog-Systems and quite simple to introduce it to clients. It’s such a great and simple system that helps people to realize and enrich the web with their ideas. I like WordPress, because with the possibility of plugins, I can get every function I want. And second there is a uge user and fan base. I love WordPress for the massive amount of resources available after 10 years! Plugins, themes, tutorials, documentation, there is no other CMS with so many great resources! Ich hoffe das geht auch auf Deutsch :) Ich bin mittlerweile ein echter wordpress-junkie geworden. Besonders die leichten responsive designs haben es mir wahnsinnig angetan. Es gibt eine großartige Community, die immer hilft, wenns klemmt, eine Unmenge an fantastischen Themes, schnuckelige PlugIns, tolle Extras. WordPress is the most empowering technology I’ve come across for years. Its changed the way I work as an artist and a designer. Hip hip hooray for WP! Since I started working with WordPress as a professional blogger and web designer my life has become richer, easier and most fulfilling. Its tools, plugins and design are very constructive and a pleasure to deal with upon a daily basis. On top of it, I enjoy working with the many available themes on the market, both free and premium. Hoping that this content management system will prove to remain successful for a lifelong experience. To see if little luck and by the way I have to update my blog. I already have a blog with my self-created template for my infrared images, but I plan to start a second webpage for my color images with wordpress. I hope to get a premium template! I like WordPress because it got me into HTML, CSS & PHP. That being said I mainly like the easy approach to create and customize beautiful looking websites. Hey Ellen, thanks for the giveaway! – the interface is user-friendly. Greetings from France and keep up the good work! I love WordPress for the community. We band together and share resources and help each other out. Other CMS can’t hire a team that can match the richness of the WP community. I like WordPress because it gives everyone the chance to create their own diary, magazine or newspaper online and share their thoughts in a simple way. It also gives you a lot of features to customise layout and functions to your taste. Ich mag WP, weil es unendlich viele Möglichkeiten eröffent. WordPress is my first choice, because the “is it feasible” question is always “yes”. I am on wordpress for 9 years now, and i still love it! WordPress hat sich in den letzten Jahren von einem reinen Blogsystem zu einem wirklich tollen Content Publishing System entwickelt. Während man damals noch belächelt wurde wenn man Seiten mit WordPress erstellte während die “Profis” mit echten CMS wie Joomla, Drupal oder TYPO3 entwickelt haben kann man heute nahezu alle Bereiche professionell abdecken. Ein Grund für die starke Entwicklung sind Seiten wie auch elmastudio die die Community vorantreiben und neben neuen Denkanstössen und Inspirationen auch handfeste Tipps und Tricks geben so dass auch Quereinsteiger sagenhafte Ergebnisse erzielen können. Nimmt man nun fertige Templates und Plugins oder läßt seiner Kreativität durch Anpassungen oder Barebone/Framework Templates freien Lauf, man kann sich sicher sein – das Ergebnis weiß zu überzeugen. Ich freue mich auf viele weitere Neuerungen. Das lernen hört nie auf. Everyday I work with WordPress, I find out something new, I really like. Great and helpful community too. Wordpress is the best plattform for blogging because it’s easy and free and we have the best community behind it with a lot of themes, plugins and more! Worspress is a pretty handy cms solution – in the meanwhile not only for bloggers. The best thing about is that its easy and fast to post new content or to manage content from anywhere you want. Dont want to miss it anymore. Weil heute dein Geburtstag ist da hab ich mir gedacht, ich wünsche mir ein Theme für dich weil uns das Freude macht. I Love WordPress, because it is Easy to use for everybody. Great about WordPress is that there is a uge Community behind wordpress. They make awesome Plugins and help each other! Thank you WordPress for 10 awesome years! WordPress? C’est la jungle, et c’est super! WP is an easy way to share my thoughts with the world. or the ones who want to read them ;-). ich mag WordPress aus vielen Gründen. Zum einen weil die Grundlagen super einfach zu verstehen sind aber man trotzdem unendlich viele Möglichkeiten hat, zum Beispiel sich aus Millionen von Themes eines auszusuchen. Genauso wichtig ist mir aber auch das man sofort Rückmeldung von den Lesern bekommt. Natürlich darf man auch nicht vergessen dass WordPress kostenlos ist. Ich würde mich sehr über ein Theme von euch freuen. WordPress is just a powerful tool. I enjoy to work with it and be able to do nearly everything I want. I’m celebrating 10 years since I started using WordPress. The original reason why? It had RSS, nobody else did. Now, it’s because it’s the best and fastest way to get a site online without having to resort to a web developer. Here’s to another great 10 years, WP! WordPress is super easy to install and use. You don’t even have to understand web design or programming to start your own website (though it will be a big plus if you are). Most hosting company even have a feature to automatically install it for you. You can turn it into whatever website you want it to be, from a simple blog to an eCommerce website. Huge community and tons of references in case you ever run into trouble and need supports. I want to start my own blog with WordPress so i’m new to it. But so far: i love it! I was looking at your wonderfull templates and started following you since yesterday. It would be awesome to win a template so i can kick start my blog! I love WordPress because it is so people-friendly. It is also very dog-friendly. Ich mag wordpress, weil es einfach zu bedienen ist & man es individuell einrichten kann. Man kann schnell und einfach damit bloggen & viele Leute so erreichen. I tried several stuff but in the end i always came back to wordpress. * Nowadays it’s different from the things we were doing 10 years ago. Remember partial custom cms systems? Or no cms at all? Happy birthday! I like WordPress ’cause it’s easy and simple to use! WordPress ist die tollste Blogsoftware überhaupt – und so vielseitig. Ich bin davon begeistert. Ich hoffe ich gewinne. Thanks to WordPress I can fulfill my dreams. love working with cms/blog systems especially wp. I luuuv WP cuz I can boast around wit’ them shiny websites it let’s me make in the blink of an eye. The Web-Wizzard – that’s what those cats call me who don’t know nuthin about WP. Thanks WP for lettin’ me shine! It’s beginner friendly and we can focus on creating great content. I like to use WordPress to display my graphic designs. WordPress is one of the finest CMS and easy to manage. Main advantage of WordPress is you have unlimited page creation features. Using this features you can create any kind of layout. Love wordpress, because it’s simple and so easy to handle. For developper or users. Love wordpress because it’s so individual and mostly without hassle. In fast keinen WordPress-Themes kann man einen so großen Schwerpunkt auf das Wesentliche feststellen, der für einen logischen, kontrastreichen Aufbau und eine unverkennbare Optik sorgt, wie bei denen von ElmaStudio. Zahlreiche Entwürfe für Webseiten, die ich mache, basieren auf Ideen, die ich den ElmaStudio-Wordpress-Themes entnommen habe. Ich bin schon seit langem auf der Suche nach einem Theme, um endlich einen eigenen Blog zu starten. Die Themes von ElmaStudio eignen sich dafür perfekt. Ein Giveaway kombiniert diese Vorteile in einer einzigartigen Chance. For years I have been enthusiastic about WordPress steady evolution and his huge potential. After installing wp-beta 3.6 and Twentythirteen theme I am convinced that future responsive web-design will get a significative kickoff out of it in the very next future. I keep visiting your site very often since I really like your design style. I like WordPress because it is easy for me to creating content and style my blog. WordPress has helped me to create things I never thought it possible to do myself. I love it! WordPress is easy to use, intuitive and straight forward to the user. Very nice is the custom made concepts for themes and plugins. congrats! Open source software is wonderful. WordPress helps me to create my dream project. I like WordPress because it is simple, yet powerful. And it is just soooo much better then other CMS’s on the market! I like WordPress because of its simplicity. You can set it up in few minutes and can have a live functioning website in just few minutes. You don’t need to go into heavy coding. If you want something, there’s a huge vibrant community to help you with anything. It provides a rock solid foundation for newbies and can be customized heavily if you are a pro user. It caters to both segments equally well – newbies and pro. This is something you usually don’t see with other CMSes.